Yes, it was Saturday February 9th, 1985 when “Film Vault Technicians First Class” Randy Clower, Richard Malmos and Ken “Tex” Miller went on the air with the very first episode of the legendary cult show called The Texas 27 Film Vault! 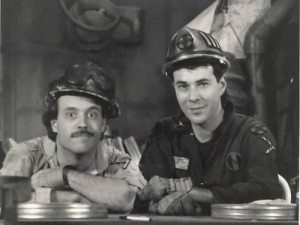 Years before MST3K this program featured the members of the fictional Film Vault Corps – “the few, the proud, the sarcastic” – showing and wryly mocking some of the worst – or at least campiest – movies ever made, often preceded by episodes of old Republic or Columbia Serials like Radar Men from the Moon, Atom Man vs Superman and many others! For the next few years Saturday nights in Texas and Oklahoma belonged to bad movies and serials, Film Vault Corps comedy sketches and interviews with figures like Vincent Price. At least for the 2 and 1/2 hours during which The Texas 27 Film Vault aired. Some of the other beloved figures from the program included Joe Riley (later famous for the cult tv show titled The Hypnotic Eye), Laurie Savino and Doug Bransom, the former Professor Cerberus himself! 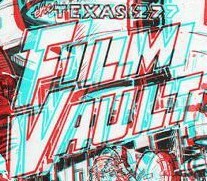 Here’s Balladeer’s Blog’s look at that very first episode of The Texas 27 Film Vault, from way down on Level 31 in the Film Vault beneath Dallas, Texas. There was no serial that first night because the movie plus comedy sketches filled the entire running time. Below you’ll also find the link to my exclusive interview with Randy Clower. If the only bad movie show you know is MST3K think of: Operation Double 007, Danger: Death Ray and Secret Agent Superdragon. The Movie: Audie Murphy, America’s most decorated soldier of World War Two was okay in westerns or military films but he is laughable as a pseudo-suave James Bond wannabe in this flick. For starters his voice is so mild and his mannerisms so meek that he comes across like Ned Flanders: Licensed to Kill! Menahem Golan (as in Golan-Globus Productions) directed and produced this flick that was distributed stateside by American International Pictures, so this was a royal wedding of sorts in terms of cinematic cheesiness. 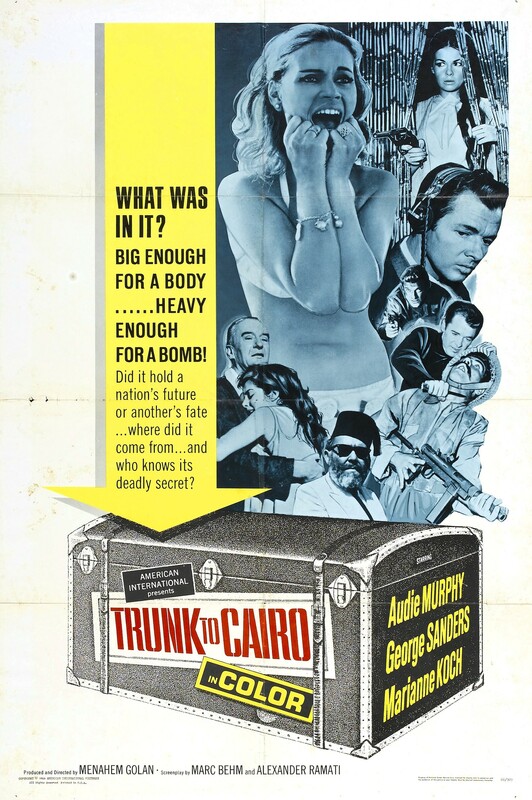 Murphy plays Mike Merrick, a CIA agent who is assigned to work with Israel’s intelligence agency Mossad in order to infiltrate an Egyptian base. A neo-Nazi scientist played by the very British George Sanders is working with the Egyptians to build rockets capable of wiping out Israel, Europe and the United States. Marianne Koch portrays Helga Schlieben, the scientist’s (Sanders) daughter. So we have a CIA agent with a Texas accent masquerading periodically as an Egyptian and a German even though he speaks neither language. GREAT personnel choice by the Agency! We also have the aforementioned veddy, veddy British Sanders turning in a comic opera-level rendition of a strutting German. Throw in various Israelis portraying Egyptians and enjoy! Hans von Brosody actually seems out of place as a German playing a German. Must have been some kind of screwup at Central Casting. This baby also features HILARIOUS day-for-night shooting, a terrorist attack on sunbathers and supposedly Italian submarines with Hebrew signage on their instrument panels (Oy vey!). 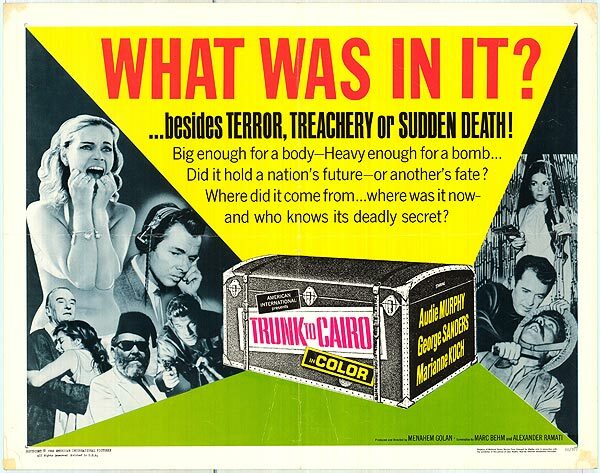 The final minutes of this enjoyably awful movie take the viewer from Cairo to Rome, partway back to Cairo and then back to Rome in a thoroughly ridiculous sequence of unlikely events meant to highlight Mike Merrick as an American James Bond. Even the humorless Roger Moore would be able to see how absurd Merrick’s superspy antics are. To put it another way, not only does Murphy as Mike Merrick fail to live up to the low standards of Bond wannabe’s like Derek Flint and Matt Helm, but he’s not even Bart Fargo or Neil Connery! Audie Murphy and the others try to play it all as seriously as if they’re on Masterpiece Theater and completely fail to capture the light-hearted thrills of the 007 films. Unfortunately the script’s periodic attempts at humor are so lame they could be used to induce vomiting if you accidentally swallow something poisonous. © Edward Wozniak and Balladeer’s Blog 2013. Unauthorized use and/or duplication of this material without express and written permission from this blog’s author and/or owner is strictly prohibited. Excerpts and links may be used, provided that full and clear credit is given to Edward Wozniak and Balladeer’s Blog with appropriate and specific direction to the original content. I can never resist shows that make fun of bad movies! Awesome! This was before MST3K or Cinematic Titanic! These guys look like creeps. I don’t know what they are like in real life.